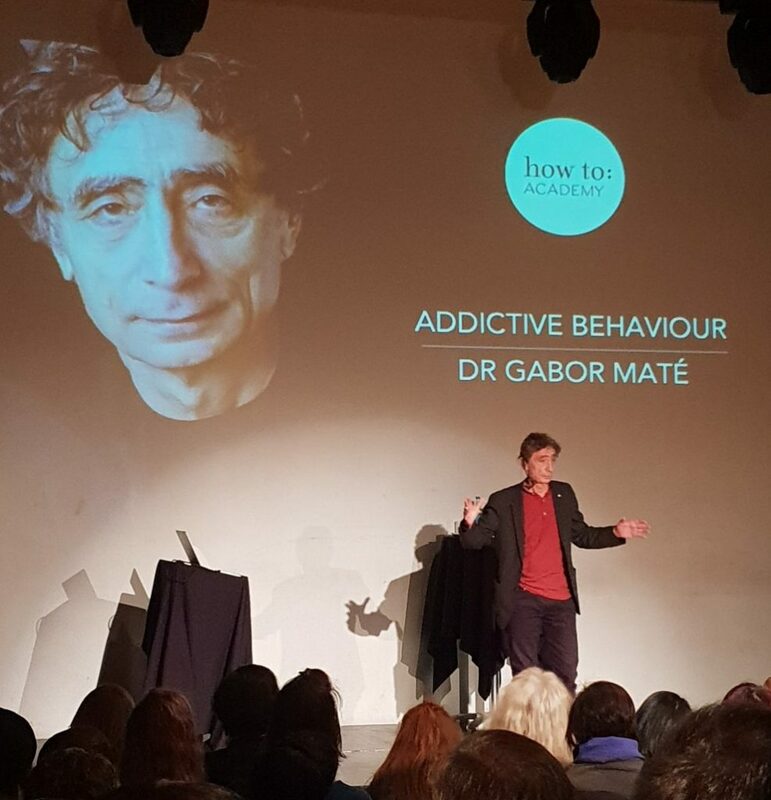 On Thursday 1st November 2018, Dr. Gabor Maté spoke for How To Academy at the Tabernacle on “How to understand addictive behaviour”. He was promoting his book “In the realm of hungry ghosts: close encounters with addiction”, and gave us an hour jam-packed with jewels of wisdom, delivered in his characteristic incisive and humane style. Below are some key takeaways from the talk. Dr. Maté uses three criteria in his definition of addiction. Firstly, craving the addictive substance or behaviour; secondly, engaging in the addictive substance or behaviour in order to experience pleasure or temporary relief from some kind of pain; and finally, the inability to give the substance or behaviour up. Addiction is an attempt to solve a problem. It is the symptom of a deeper malaise, in most cases, trauma. When bad things happened, or simply when good things that should have happened didn’t (when children didn’t get their needs met and were neglected), this can lead to addiction. The most important question is not “why the addiction” but “why the pain?”. In order to heal addiction, we must look at the underlying trauma. ALL addiction has its roots in some kind of trauma, but not all trauma leads to addiction. The shame around addiction is the shame of trauma. Society tends to deny and ignore trauma. The adverse childhood experiences study is one of the most important studies ever done. There is a profound correlation between adverse childhood experiences (the major ones being emotional, physical and sexual abuse; domestic violence; household substance abuse; mental illness in the household; parental separation or divorce; criminal household member; emotional or physical neglect) and addiction. We have to heal the underlying trauma before we can heal the addiction. When you cannot fight or flee, your brain tunes out in order to cope with a stressful environment. Tuning out is a way of coping with overwhelming stress. This self-soothing behaviour, can lead to addiction later on. Tuning out can continue to be a problem, causing a lack of presence and focus in situations which trigger us, even when there is no obvious external threat. We tend to get into relationships with people at the same level of trauma and self-esteem as ourselves. Trauma is not what happens to us, but what happens inside us physiologically. Our brains have opiate receptors and endogenous opiates to help us cope with pain, which can be triggered even by a placebo. This means that just a thought can trigger the release of our internal pain killers. Addictive substances such as heroin and opium fit perfectly into these receptors. Whatever substance or behaviour we are addicted to helps us to get pain relief, love, connection and joy… that’s the opioid system. Of course we are going to want that substance or behaviour… Who does not want to feel that way? Furthermore, the stimulant neurotransmitter dopamine flows in the brain when we seek food or a sexual partner… We feel very alive when our brain is flooded by dopamine. If we don’t feel we are loveable, the heightened charge of the hunt and the chase floods us with dopamine which makes us feel good. The more we get from the outside, the more we need. Addicts are addicted to the feel good chemicals released by a certain substance or behaviour (eg: dopamine or opiates), not to the substance or behaviour itself, which is why Dr. Maté is not interested in the particular substance or behaviour that the person is addicted to. Addicts lack stress regulation and impulse control (similar to infants) often due to their brain circuits not developing properly in infancy. Therefore, stress often causes addicts to relapse, as it overwhelms them. In our current societies, communities have broken down and there is more loneliness, isolation, poor relations between kids and parents, etc. It is no surprise that mental health issues, ADHD and addiction are increasing with the lack of supportive communities and connection. We need unconditional acceptance and compassionate care for our nervous system to relax. The most important criteria for addicts to improve is the relationship with a therapist, who can provide a compassionate, caring environment. Acknowledging powerlessness paradoxically gives us our power back. We have the power to accept powerlessness. Pushing an addict to change or give up an addiction usually only results in them pushing back. The desire to change has to come from the addict themselves in order to have the best chance of success. I am a writer and philanthropist specialising in mental health and the Middle East. 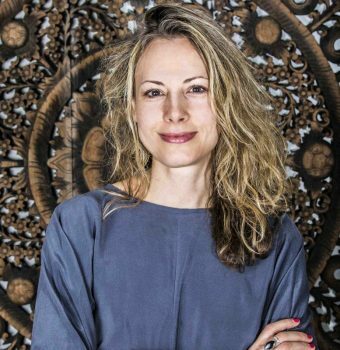 I have a first class BA in Languages and Literature from Oxford University, an MSc in European Studies from the London School of Economics, and an MA in Near and Middle Eastern Studies from SOAS. I have worked for Rockefeller Brothers Fund and Ogilvy & Mather in New York, and for Musiclegal and The Prince's Trust in London. I co-founded and am a trustee of The Horizon Foundation, and am the Founder and Editor of MindHealth360.